The new 28nm chip runs at 1.2 GHz, has no less than 8 ARM cores and targets the mid-range segment of the market, but no devices powered by it have been announced yet. Huawei unveiled a new chip yesterday, namely the eight-core Kirin 620. This 64-bit processor uses eight Cortex-A53 cores clocked at 1.2 GHz, so one of its future competitors will be the Qualcomm Snapdragon 410. The Kirin 620 should provide about the same amount of processing power as the Qualcomm Dragon 410 which is already on the market. 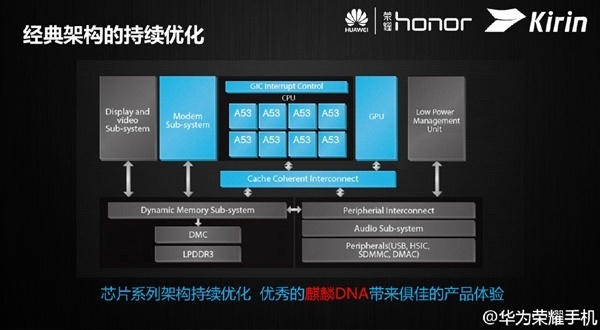 They both use the same Cortex-A53 core running at the same frequency although Huawei's chip has four extra cores. On the other hand, Qualcomm's SoC features Adreno 306 graphics, a better choice than the Mali-450 MP4. There are no benchmark results available yet and Huawei did not mention anything about the first devices that will use the new octa-core Kirin 620 SoC.